All Riders, Supporters and Volunteers must complete the registration process. Riders must be over 15 years of age. For those who are under 18 years of age, a responsible adult travelling with them on the event must complete the registration and accept responsibility the minor during the seven days of the event. Volunteers must contact Ride Coordinator for an appropriate role prior to registration. ‘Dirty Boys’ (Mountain Bike Riders) must complete an Expression of Interest Form. The ride fees are in two parts. One is a registration fee and the other is fundraising with a minimum requirement. The registration fee is used to cover costs not met through corporate sponsorship and donations such as food, fuel, hire of equipment and administration. Registrations close on the 31st of May 2019. For anyone wishing to undertake fundraising activities including individual or team sponsorships, we will provide an official letter confirming your registration and participation in the event. All funds raised are for the Cairns to Karumba Bike Ride and must be deposited promptly. We will provide official receipts either directly to the contributor or to you to pass back, but only once we have confirmed the actual deposit has been made. To arrange this please contact us. Fundraising for the ride closes on the 31st of July 2019, however the minimum fundraising value must be met 10 days prior to the commencement of the ride. *The Dirt Ride is limited in numbers. This allows us to provide all riders with the safest and most enjoyable experience possible. All ‘Dirty Boys’ must complete an Expression of Interest form and return this to helena@c2kbikeride.com.au before registering online. ** Unsupported riders take their own tents and other camping equipment. This gear is transported each day and a return trip to Cairns for you and your bike is provided at the end of the ride. Bike boxes/bags for road bikes are placed in the luggage truck at the start of the ride and then used when in Karumba after completing the 780kms. Mountain bikes are placed on trailers for the return journey. Please note that all unsupported riders will receive a bus ticket for the return journey. ***Support Persons usually set up their camp for a rider who is taking on the 780km challenge. We are often asked why these people need to pay to be part of the event. There are three key reasons; 1. The event provides food and drink, accommodation venues and nightly entertainment for all persons on the ride (riders and support persons) 2. Duty of care – event organisers take responsibility for the general safety of all persons on the ride, providing Police and medical support, plus arranging key logistical elements that benefit all involved with the C2K adventure. 3. All support persons receive an event top as part of their registration. ****All riders under 15 years of age will miss the first two days and ride from Mt Garnet. Permission may be granted in writing by the Coordinator to complete the whole ride. This approval process will take into account the levels of risk and the skill of the young rider. This is to be negotiated with the coordinator by the rider’s care-givers at least a week before the commencement of the ride. This is necessary as Pack Riding requires sound mature judgment on the part of all riders. Judgment necessary to avoid potential spills leading to major physical injuries of members of the pack. We provide everyone with a simple online fundraising system that makes your job easy. We have provided you with a web-based fund raising process whose purpose is to support not-for profit events like ours by integrating our fundraising needs into the everyday activities of modern life. You can communicate with friends and colleagues via the web to seek donations to support your involvement in this great ride. Simply click the Fundraising button and you’re away! Sponsorship, donations and other fundraising activities can also be used to raise your funds – be imaginative. 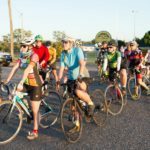 Please note that in order to be eligible to ride the Cairns to Karumba Bike Ride, all fundraising requirements must be met 10 days prior to the event . Provision will not be made for these monies to be paid at the briefing day or during the ride itself.